A journey through life with the burpo family in portland, ore. I came home from work tonight to find a letter sitting on our dining table. It had come home with Elena from preschool. Jeff saw me looking at it and said, “Sad news.” Indeed. It was in reading this heartbreaking letter that I realized that the Tumble Bus has been a part of both Ian and Elena’s young lives in Portland. The Tumble Bus and Ike have been visiting the Vermont Hills’ St. Andrews’ site since Ian was in daycare and preschool there. 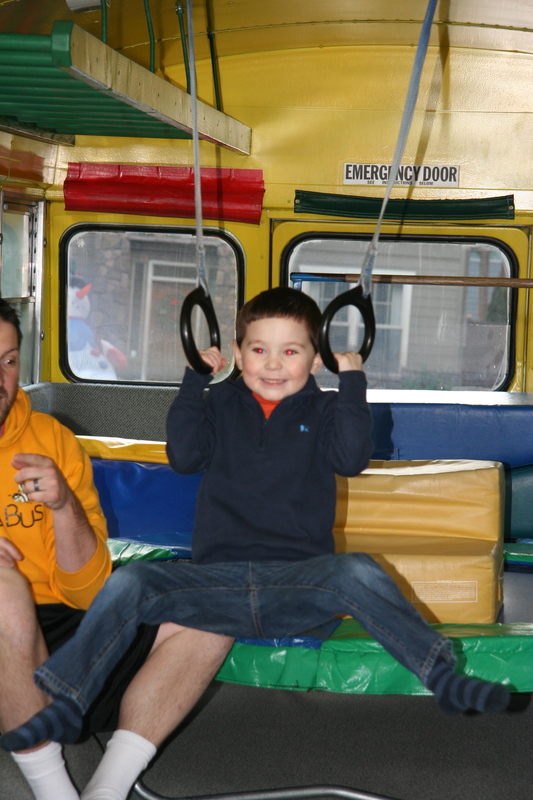 Once a week the bus, this hollowed out yellow school bus with tumbling equipment for little kids, would visit and kids who signed up could get out some little kid energy. But it wasn’t until we gave Ian his first party when he turned 5 that we learned of Ike’s true talent with kids. Parked alongside our house, Ike and his partner hosted the greatest little bus party you can imagine. The kids had a blast, laughing and jumping around while he hosted them through silly games. It was an all-around great experience and the perfect first birthday party for Ian. After Ian moved on and Elena started going to St. Andrews, she too eventually became interested in the Tumble Bus. Being much more hesitant to participate in activities than Ian had ever been, we jumped at the chance for her to join in a “class” type situation. I remember her teacher telling us that at first she had to go with Elena on the bus to help with her fear of new situations and adults she didn’t know. But it didn’t take long before we’d hear excitement in her voice when it was “Tumble Bus Tuesday” and stories of Ike’s silliness that day after we picked her up. 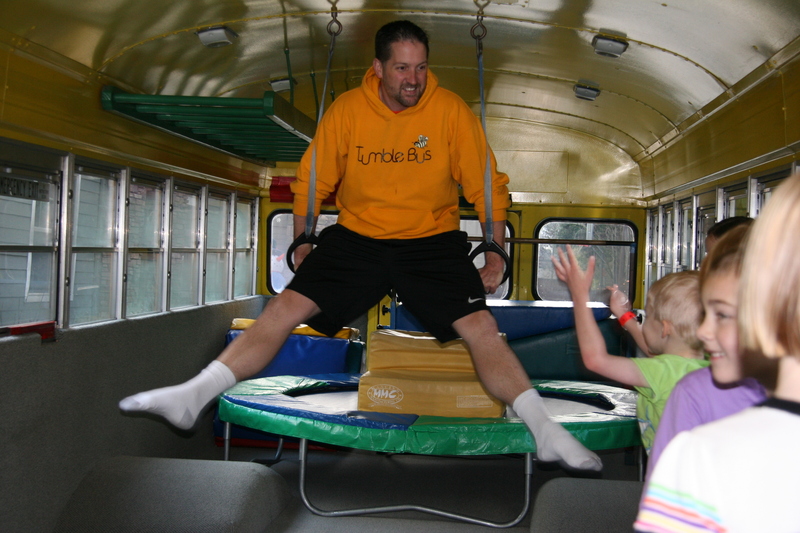 She loved the Tumble Bus…so we kept signing her up. This November Elena turned 5 and we decided that like with Ian, this was a good year for her first party. She had been so hesitant for so long to be in new situations and around her friends outside of a familiar environment. Though she had been making huge strides in recent months, we really couldn’t think of a better, safer environment for her than to have the Tumble Bus host her party. Plus, it was kind of like 5th birthday party tradition in our house! 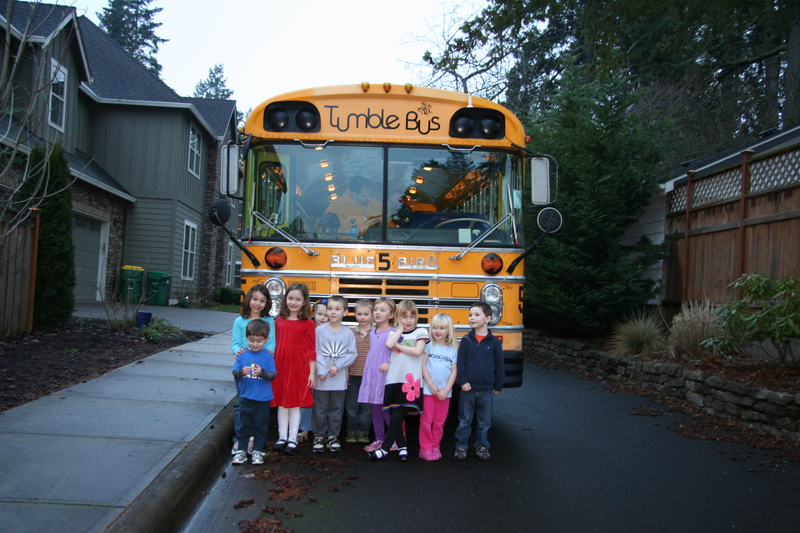 So the weekend before Thanksgiving several of her little friends joined us at our home for a Tumble Bus party. I don’t think it would be exaggerating to say that Elena had the time of her life that morning. By then, Ike and his wife Erica had moved to Bend, but Ike had found an amazing replacement in Jeff, who Elena adored just as much as Ike. 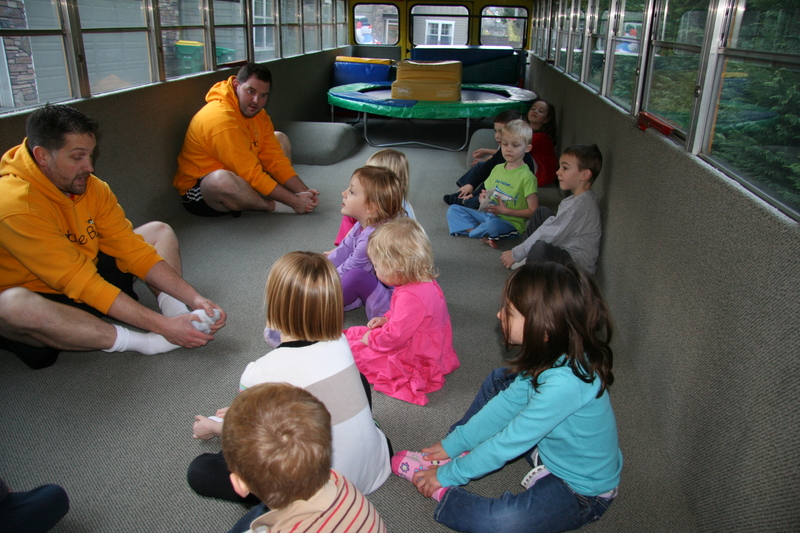 Jeff and his wife hosted the kids on the bus, and what great fun it was to watch all that giggling, tumbling and preschool happiness. There was also an 8 (almost 9) year old who relived the fun. 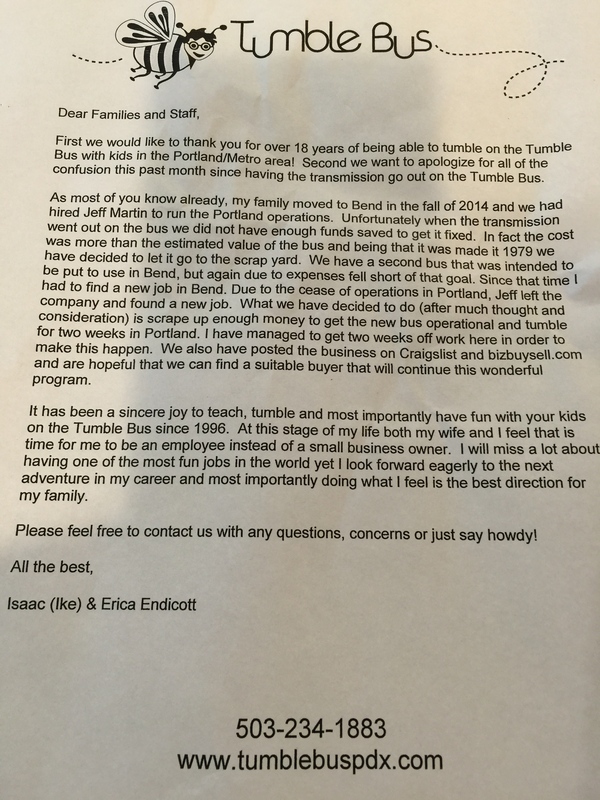 As the letter notes, Ike and Erica would love to find a buyer for the business, so if anyone out there is interested in helping keep the Tumble Bus Portland alive, please contact Ike and Erica at 503-234-1883 or via the website. This entry was posted in That's Life and tagged Tumble Bus by burpobanter. Bookmark the permalink. It truly is sad to know a point of stability and grounded-ness could exit your life. Grieving is appropriate. Hopefully your post will rustle up another kind spirit to carry on! Thanks so much for the kind words. Blessings to your wonderful family.